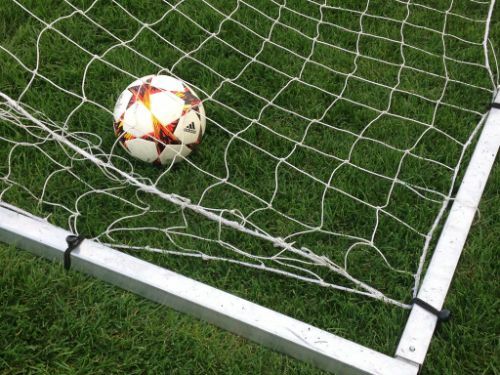 Trapping a Soccer ball seems like an easy enough thing to accomplish, unless you’ve tried it. Almost never will a ball come rolling slowly and evenly straight at you to the point where you can pick up a foot and place it on top of the ball, stopping it perfectly. Receiving a soccer ball coming at you at all different speeds and angles takes the work and coordination of almost every muscle in your body as you will probably be running to trap it, using your head and eyes to track it, arms for balance, core and lower body to adjust and receive it. The first thing you need to focus on is tracking the ball (or seeing where the ball is heading and when it will be possible to make a touch on it). It is very important to watch the ball all the way in until it makes contact with your foot. In soccer the ball can bounce off of the grass in many different ways and can even curve while in the air. This means that whatever direction the ball is traveling in, you need to get your body in the path of the way the ball is traveling and get into a balanced position in preparation for receiving the ball. In a more advanced level of trapping you may be able to intercept the flight of the ball simply by stretching out a leg and absorbing the energy of the ball by moving your leg or foot slightly away from the ball after contact. This takes much time and practice and is sometimes messed up by even the most experienced of players. While keeping your eyes on the flight of the ball and in a balanced stance turn your h2est foot outward and be ready to stop the ball with preferably the inside of your foot. The inside of your foot is the softest part of your foot and also has a slightly indented curve which is very handy in getting a good controlled stop on the ball. You want to generally touch the ball as it hits the ground on the upper one third of the ball where it can be considered both the top and the side. In more advanced maneuvers you may learn to use the top or outside of your foot as well depending on the flight of the ball and your skill level or comfort. There may be mere milliseconds between the previous step and this one. Just as the ball strikes the floor and you have your foot ready and balanced with your instep on the upper one third, you need to have the motion of the foot that is stopping the ball moving slightly away from or with slightly the same speed and force that the ball is approaching in, in order to absorb the impact. This is very important because if you do not absorb the impact of the ball it will surely bounce quickly out of range off of your foot and may be turned over to the opposing team. This step will occur just as fast as the last two and will take some practice to get a feel for. Just as you feel the balls momentum coming to a halt, apply slight pressure more towards the top side of the ball and down into the ground. Readjust your balance to the foot without the ball in order to be able to make a variety of moves with it and have it under control. These 5 steps need constant practice even by the most seasoned of professionals in order receive the ball with many parts of the body sometimes while moving and sometimes while simultaneously making their next pass, shot or dribble. Remember that in soccer your first touch is the most critical because it dictates what you can do as your next move. The more control you have of the ball the more creative and fun the beautiful game of soccer can be!